• New to this release: Selling – a top feature request! 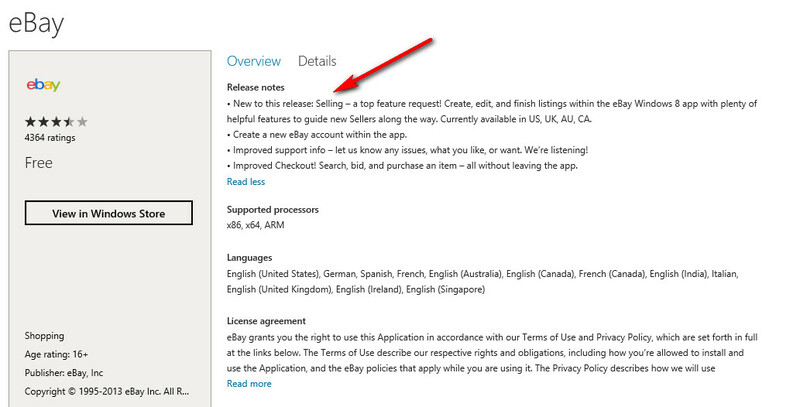 Create, edit, and finish listings within the eBay Windows 8 app with plenty of helpful features to guide new Sellers along the way. Currently available in US, UK, AU, CA. • Create a new eBay account within the app. • Improved support info – let us know any issues, what you like, or want. We’re listening! • Improved Checkout! Search, bid, and purchase an item – all without leaving the app. These are big-deal updates and you should download the update now if you’re using Windows 8. Of course if you’re using Windows 8.1, this will be downloaded automatically for you if you’ve not turned off auto-update. Previous Previous post: Mirror’s Edge (GAME) FOR IOS FREE FOR A LIMITED TIME!